In the demanding world of food-and-beverage service, accidents behind the bar or in the kitchen are common and not always preventable. Drinks are spilled, dishes and glasses may be broken, but work moves on at the same speed in order to make sure the customers are happy. Food and Beverage storage areas are another place where broken glass can become a problem if items are not secured properly. Broken glass can pose a hazard to employees and guests if not cleaned up thoroughly. Shards of glass can be very difficult to detect and can cause serious injury if ingested or stepped on. Restaurant staff must be extra careful that broken glass behind the scenes does not make its way into ice bins, glasses, serving plates, trays, food, or onto cleaning rags or severe injuries may result. Using rope, masking tape or bungee cords is one way to keep items such as liquor bottles and narrow items from falling off shelves and breaking. Another way is to secure them using a shelving fencing system specifically designed for this purpose. 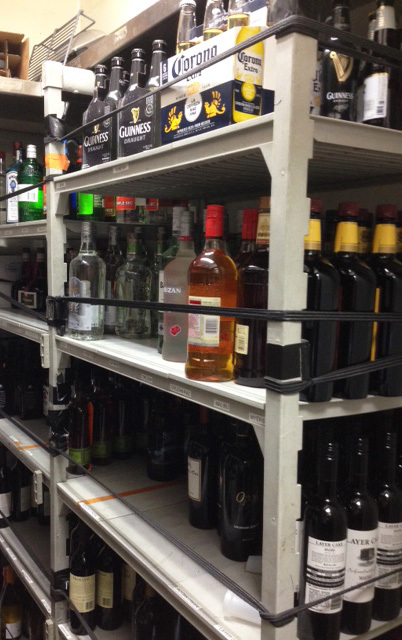 Having the ability to secure glass bottles is just one of the benefits of the Camshelving® Fencing System. Fencing provides safe storage from breakage on valuables such as china, glassware, vases and catering supplies all while keeping items organized. This convenient accessory can also be installed on mobile shelving units that are used for transporting lighter and smaller items from one area to another. Knowing you can help protect your inventory and your business against unnecessary breakage is a benefit you can’t put a price tag on. Click here to see the fencing kit. Protect your profits fencing them in; contact a Cambro Representative for more information on Cambro Fencing Systems.